In Liberation in the Palm of Your Hand Pabonka Rinpoche explains how the great Atisha would purify any negativity, no matter how small, immediately. Even in public or when riding his horse, as soon as he noticed a breach of his ethics, he would stop what he was doing, drop to one knee and then and there, purify it with the four opponent powers - the powers of dependence, regret, remedy and restraint. 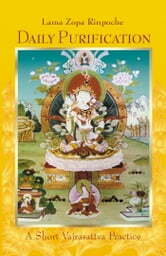 Atisha practiced purification in this way because of his deep realization of the psycho-mechanics of negative karma, especially its four fundamentals: negative karma is certain to bring suffering; it multiplies exponentially; if eradicated, it cannot bring its suffering result; and once created, it never simply disappears. Through the study and practice of Dharma, we should try to attain Atisha’s level of understanding. In the meantime, we should try to practice as he did. 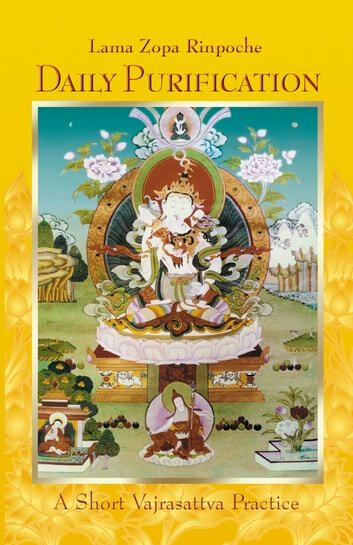 Therefore, out of his great compassion, Lama Zopa Rinpoche has composed this short Vajrasattva practice and requested that it be published in a pocket-sized format that is easy for people to carry round and have available at all times. Thus, we can be like the great Atisha - whenever we notice we have broken a vow or created any other kind of negative karma, we can whip out our little Vajrasattva book and purify that negativity with the four opponent powers without a second’s delay.